About 8,000 km away from the headquarters of Tesco, the world’s third largest retailer by sales, a group of information technology (IT) professionals is at work to make robotics a part of grocery shopping across the UK chain’s stores worldwide. The campus of Tesco HSC (Hindustan Service Centre) is spread on 15 acres in Whitefield, the IT hub on the outskirts of Bangalore for multinational corporations. Experimenting is on with robotics and internet-enabled clothing, as well as wearable devices, in a highly secretive environment. The place provides about three-fourths of the technology and innovation knowhow to stores and businesses run globally by the Cheshunt (UK)-based grocery and general merchandise major, for multi-channel shopping. The Tesco group has a little over 6,500 stores across 12 regions. It has been in the news recently for an accounting mess. An investigation found the group had overstated its profit by £263 million ($423 million). This figure related to the first half of 2014 and the previous two years. Chairman Richard Broadbent has announced his resignation over the matter. Vinod Bidarkoppa, director (group IT) and chief information officer, Tesco HSC, told Business Standard recently that the group’s labs in India and Britain are together working on robotic innovations aimed for its stores worldwide. Some of these could take up to five years to come into the mainstream. Robots are widely used in many industries such as automobiles and consumer goods. Their use is being actively discussed for rescue and disaster situations, as in the current ebola epidemic. They can assist store staff and customers in accessing products faster on the shelves and a quicker check-out, among other things, analysts say. Drones, being planned for use by American e-commerce giant Amazon for faster delivery of products, are still not a priority for the $115-billion Tesco, it is learnt. Yet, the UK chain, witnessing significant growth in e-commerce, might pick up a thing or two from the Indian space. For instance, Tesco HSC might look at weaving in cash on delivery, a popular service in Indian e-commerce, for some Asian markets such as Thailand. A cosy group of designers, researchers and developers make up the primary universe for Tesco Labs. India has eight of them out of a team size of around 30, with the rest coming from the UK and Hong Kong. 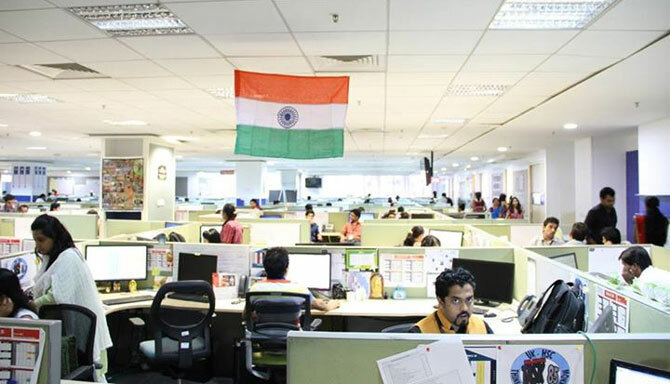 The total employee base at Tesco HSC is about 6,500, including app writers, programmers and other technology personnel. An executive at the Bangalore facility takes this reporter through a demo of many futuristic technologies for smart homes and smart stores, while keeping lots under wraps. Future catalogues, seamless check-outs, insta-search, Mapster, shopping list on the go — these are some of the services that have been launched or piloted already, the executive says. Mapster, for example, is an application tracking the company's vans in real time traffic and informing customers if there's a delay. Much of the buzz at the labs is around a micro-interaction being tested. For example, an android-enabled inventory check technology will automatically look for empty bottles and jars in kitchens or bathrooms, and place an order for it, using a mobile app. To make all this happen, some 80 young men and women, mostly hired from regional engineering colleges, are engaged in writing apps. Several mobile phones of different makes are connected to multiple screens to see the results. "We don't create technology, we create experiences,'' a techie says, while explaining the role of the apps that are being churned out from this back office for the multinational grocery major.